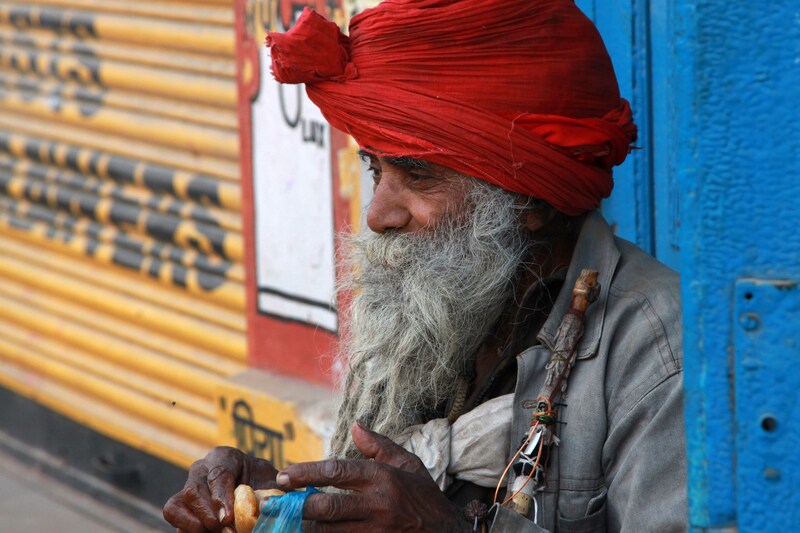 I spotted this rather eccentric looking gentleman more than once in my local patch in Varanasi. He would always sport an interesting selection of clothes including some very long woollen socks, which seemed totally necessary as the temperatures rose, but I think he was rather fond of his assemblage and didn’t want it to change. I get the impression that he is a kind of holy man, though he has chosen not to wear the usual orange or saffron robes of the sadhus. I also think that he is smiling, though it is hard to tell because of his beard. Maybe I’m influenced by the bright and cheery colours, but I like to think that there’s a twinkle in his eyes – maybe thanks to the snack that he’s enjoying. I think the photo works because of his kindly face and also because of the combination of bold primary colours. Yes, and it works very well. Even the blue, what suspect is a bag he is holding, in his fingers continue the blue of the wall. Very nice composition. Thanks for your insight and compliments. I think you’re right about the bag, which is why I didn’t object to it being in the frame. I love harmony of colours in pictures, and funnily enough I find it happens a lot.